RSS is short for Really Simple Syndication, an internet standard for publishing updates to web-based content. You may hear it called web feeds, XML feeds, RSS channels, subscriptions, syndicated content -- by any name, it's all RSS -- and one of the most useful bits of internet technology to come along. As a reader, you don't have to keep checking on your favourite blogs and websites to see if there any new articles have been posted. Subscribe to the sites' RSS feeds, and you'll receive updates automatically in a feed reader or by email. If your interests change and you don't want to receive a certain site's updates any longer, you can unsubscribe with just a click of the mouse. No fuss, no email spam, no customer-service run-around. As a web publisher, RSS helps you to reach out to new audiences -- syndication means that the same web content can be published in many places online at one time. Most importantly, RSS makes it easy and convenient for interested readers to choose to receive your message. Here's how to get started with subscribing to and reading RSS feeds. RSS is made for computers to share information with other computers. If you look at a raw feed page, it will have a lot of code mixed into it. Feed readers or news aggregators (two common names for the same kind of tool) make sense of that code and display the content in a browser-friendly format. Personal home page services (like My Yahoo, Google IG, My MSN, PageFlakes, Netvibes, and so on) use RSS to serve up syndicated content like news, weather and stock quotes. If you sign up for one of these free personalized home pages, you can choose to add your own favourite content from any blog or website that publishes an RSS feed. If you use the Firefox browser, you can get RSS feeds as Live Bookmarks; and the most recent version of Internet Explorer has a feed reader built in, as do the Opera and Flock browsers. Many people choose to handle their RSS subscriptions with other web-based or desktop tools that were built for that primary purpose. Some of the most popular free web-based feed readers include Bloglines, Google Reader, and Rojo, while examples of popular desktop or offline feed readers include Newsgator and Feed Demon. For more advanced users with many subscriptions to manage, Blogbridge is a free (open source software) feed reader for Windows, Mac and Linux computers that allows you to easily save, search, tag, bookmark and publish your feeds. It can be synchronized with an online MyBlogbridge page, as well. Another option is to subscribe to get RSS feed updates by email. You can view RSS content with Microsoft Office Outlook 2007 and Thunderbird for example: it's a convenient feature that's increasingly in demand. Meanwhile, a number of web-based services, such as Feedburner and Feedblitz, work behind the scenes to make it easy for readers to subscribe to RSS updates by email. The odds are, if you see a separate "Subscribe by Email" link on a website, one of these services will be handling the RSS-to-email delivery. Browse to your favourite website or blog, and look for its subscription or feed options. You might see a text link that invites you to subscribe, or you might see a collection of clickable buttons for different feed readers. You might also see a little orange rectangle with the letters 'XML' or 'RSS' on it. The new standard RSS icon, that looks like an orange square with curved lines (reminiscent of radio waves), is used on more and more sites -- sometimes in different colours and sizes, to match the website's design. Simply click on any one of these links or icons, when you want to subscribe to a site's RSS feed. Every so often, what you get may be a page that's clearly made for computers and not for people, but don't worry. Just copy the URL for that page from your browser's location bar and paste it into your feed reader as the "feed URL." 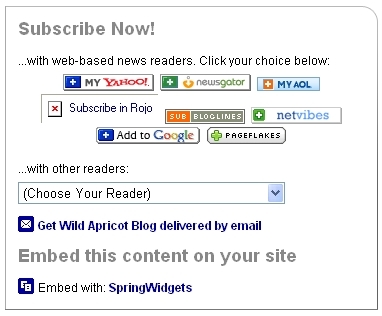 Fortunately, many sites -- including Wild Apricot -- now use Feedburner to make subscribing even easier for readers who are new to RSS. Clicking on the "subscribe" text link or on the RSS icon will take you to a dynamic web page showing the most recent posts in an attractive, readable format. Up in the upper-right corner, you'll see a box with subscription options. Simply click on the button for your favourite feed reader, or select one from the drop-down list. Notice that there is also a link that offers you the option to subscribe by email, and an option to show news from the Wild Apricot blog on your own website. Click the subscription option of your choice, confirm, and that's it -- you're subscribed! Now, whenever your favourite web content is updated, you won't miss seeing the news. Good to hear that you found this useful, Sharon! Feel free to contact me at rebecca @ wildapricot.com with any suggestions for future mini-tutorials you'd like to see here. Great post - one I was going to do on my org's own blog. Many internet savvy people still don't use RSS feeds (even if their sites offer them), but they're essential to manage the information deluge. Thanks for sharing the step by step info! Casey, I do think you're wise to think of adding a "What is RSS?" snippet to your blog. We've noticed more and more blogs doing it just lately, and you can never go wrong with making it easy for a casual visitor reader to become a subscribed reader! If your nonprofit website includes an RSS feed, are you making the most of that technology? A free online service called FeedBurner turns your blog's RSS feed into a browser-friendly page that makes it easy for readers to subscribe to your blog updates. Helpful post. I created a similar "What is RSS" page (though not as thorough) on our site. I found this site useful to generate a number of RSS feed buttons at once. Note that I ended up having to redo the Yahoo code it generated by just using Yahoo's tool for generating the button code. There are many Online RSS feed readers and selecting 1 according to your needs is a big task. This leads to the comparison of these feed readers. @cpna, that is a useful site - thanks! @Yogesh, thank you for tipping us off to that TechArena post comparing online feed readers: it is indeed very detailed, and the chart at the end of the post is very useful for a quick overview. I noticed that the same post author also has a detailed comparison of desktop RSS feedreaders, too - http://forums.techarena.in/showthread.php?p=3747995 - so between those two posts, anyone looking for a feedreader should be well informed! If your nonprofit is active in social media, you already know the importance of closely monitoring what’s being said online about your organization and your cause. Set up a few key Google Alerts, and your listening task becomes a whole lot easier.